The IAM is warning that from 1 July 2012 all drivers visiting France will need to carry a breathalyser kit in their cars, as French drivers will have to. From November 2012 there will be an €11 fine for not complying with this. With a start date for the new measure of 1 July 2012, the rules will apply for anyone travelling to or through France by car in the summer holiday season, even just for a day trip. The IAM is advising motorists in France to have at least two single use breathalysers at all times, so that if one is used you still have one to produce for the police if you are stopped. Aternatively, multi use testers are available from Alcosense. 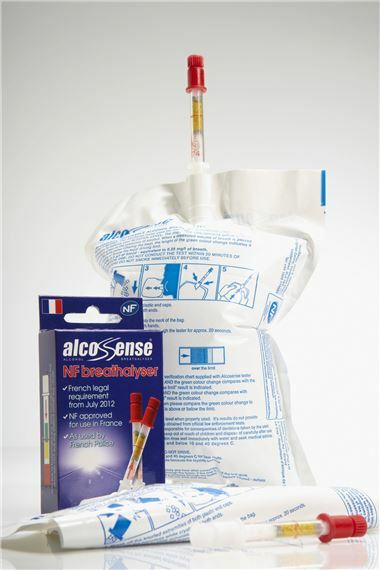 AlcoSense has also launched a new single-use breathalyser the AlcoSense Single. These come in a cigerette-sized pack of two for £4.99 and are the only breathalysers in the UK that meet the French standards. Alcosense Singles. Anyone driving in France is already required to carry a warning triangle and a fluorescent safety vest to use in an emergency. Additionally UK motorists must display a GB plate and have their headlights adjusted to the right.